A flute is a musical instrument that produces sound when a stream of air is directed against the edge of a hole, causing the air within the body of the instrument to vibrate. Most flutes are tubular, but some are globular or other shapes. Some flutes are played by blowing air into a mouthpiece, which directs the air against the edge of a hole else-where in the flute. These instruments, known as whistle flutes, include the tubular recorder and the globular ocarina. Other flutes are played by blowing air directly against the edge of the hole. Some flutes are held vertically and are played by blowing air against the edge of a hole in the end of the flute. These instruments include Japanese bamboo flutes and the panpipe. The panpipe, also known as the syrinx, consists of several vertical flutes of various sizes joined together. Other flutes are held horizontally, and are played by blowing air against the edge of a hole in the side of the flute. These instruments, known as transverse flutes, include the modern flute used in orchestras. Flutes have existed since prehistoric times. A fragment of a cave bear thigh bone containing two holes, discovered in Slovenia in 1995, is believed by some scientists to be part of a flute used by Neanderthals more than 43,000 years ago. Flutes were used by the Sumerians and Egyptians thousands of years ago. Some ancient Egyptian flutes have survived, preserved in tombs by the arid desert climate. This Egyptian instrument was a vertical flute, about one yard (0.9 m) long and about 0.5 in (1.3 cm) wide, with between two to six finger holes. Modern versions of this flute are still used in the Middle East today. The ancient Greeks used panpipes, probably indirectly influenced by more sophisticated Chinese versions. The transverse flute was used in Greece and Etruria by the second century B.C. and later appeared in India, China, and Japan. Flutes almost disappeared from Europe after the fall of the Roman Empire, until the Crusades brought Europeans into contact with the Arabs. Vertical flutes spread from the Middle East to Europe, and are still used in the Balkans and the Basque regions of Spain and France. Transverse flutes spread from the Byzantine Empire to Germany, then appeared in Spain and France by the fourteenth century. During the Renaissance, transverse flutes consisted of wooden cylinders of various sizes, typically made of boxwood, with a cork stopper in one end and six finger holes. During the late seventeenth century, the Hotteterre family, noted French instrument makers, redesigned the transverse flute. 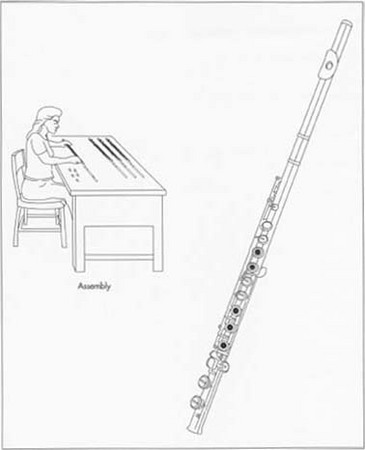 Instead of a single cylinder, the flute consisted of a head joint, a body, and a foot joint. Modern flutes are still made in these three basic parts. The new flute also had a single key added, allowing more notes to be played. After 1720, the body was often divided into two parts of varying lengths, allowing the flute to be adjusted to play in various musical keys. By 1760, three more keys were added by London flutemakers, followed by two additional keys by 1780 and two more by 1800. The transverse flute was completely redesigned in the middle of the nineteenth century by the German instrument maker Theobald Bohm. Bohm changed the position of the holes and increased their size. Because the new holes were impossible to reach with the fingers, new mechanisms were added to cover and uncover them as needed. The Bohm system is still used in modern transverse flutes. Some modern flutes are made from wood that produces a different sound from metal flutes. These wooden flutes generally have metal keys and mechanisms. Most flutes are made of metal. Less expensive flutes, intended for students, may be made from alloys of nickel and other metals. More expensive flutes may be plated with silver. The pads attached to the surface of the keys in order to cover the holes are made of cork and felt. The springs that provide tension to hold the keys firmly against the holes may be made of steel, bronze, or gold. The pins and screws that hold the mechanism together are made of steel. The mouthpiece, containing the hole into which air is blown, may be made of the same metal as the rest of the flute, or it may be made of another metal, such as platinum. Every flute is an individually crafted work of art. The flutemaker must consider the needs of the musician who will use the flute. Students need relatively inexpensive but reliable instruments. Professional musicians must have instruments of very high quality, often with special changes made in the keys to accommodate special needs. The most individual portion of a flute is the head joint. Professional musicians often test several head joints before selecting one which produces the sound they prefer. Head joints are often manufactured to meet the special demands of individual musicians. The material from which a flute is made greatly alters the sound which is produced. Wooden flutes produce a dark sound. Silver flutes produce a bright sound. The thickness of the metal used to make a flute also alters the sound it makes, as well as changing the weight of the instrument. All these factors may influence the design of a flute preferred by a particular musician. A flute may be elaborately decorated. The physical appearance of a flute is an important consideration for professional musicians who perform in public. The most detailed designs are likely to found on the professional quality flutes. The process of forming these designs, known as chasing, requires the skill of an experienced artist, and makes the individual flute a truly unique instrument. A flute is made of hundreds of components, ranging from the relatively large body to tiny pins and screws. Although some of the small components are interchangeable and can be purchased from outside manufacturers, the vast majority of the components must be individually shaped for each flute. 1 Early flutes were made with hand-forged keys. The modern method is usually die casting. Molten metal is forced under pressure into steel dies. A group of connected keys may be made in one piece. Alternately, individual keys may be stamped out by a heavy stamping machine, and then trimmed. 2 The components that will make up the keys are immersed in a flux solution, containing various chemicals that protect the metal and aid in the soldering process. The components are then soldered together into keys. They are also soldered to other components that will move the keys. The keys are then cleaned in a solution that removes grease and any excess flux. The clean keys are polished and inspected. Keys for inexpensive flutes may be placed in a tumbling machine, where friction and agitation of pellets in a revolving drum polish the metal. More expensive keys will often be buffed individually. Flutes are comprised of hundreds of components, ranging from the relatively large body to tiny pins and screws. The keys are die cast and fitted with pads made from layers of cork and felt. Tone holes are formed in the body of the flute by either pulling and rolling or by cutting and soldering. In the pulling and rolling method, the holes are drilled in the tube, and a machine pulls the metal from the edges of the hole and rolls it around the hole to form a raised ring. If the tone holes are to be cut and soldered, die cut metal rings are soldered to the drill holes. key that will cover the tone hole. Felt is cut and attached to the cork, creating a protective covering. Tone holes are formed in the body of the flute. They are formed by a process of pulling and rolling or by cutting and soldering. Either process requires great precision to ensure that the tone holes are located in the correct position and are of the correct size. 4 In the pulling and rolling method, the holes are drilled in the tube. Next, a special machine pulls the metal from the edges of the hole and rolls it around the hole to form a raised ring. The tone hole is then smoothed. 5 If the tone holes are to be cut and soldered, metal rings are die cut from sheet metal. The rings are then cleaned and polished. Holes are drilled in the tube and the rings are soldered around the holes to form the tone holes. 6 Rods that support the keys are soldered to the body of the flute. Next, the keys are attached to the rods with pins and screws. Springs are attached to provide tension to hold the cork and felt pads firmly against the tone holes until they are lifted when the keys are operated by the musician. 7 The mouthpiece is shaped and soldered to the head joint. The head joint, body, and foot joint are fitted together and adjusted. The musician must be able to assemble and disassemble the flute easily, but the fittings should be tight. The flute is tested for sound quality. It is then disassembled, cleaned, polished, and packed into a special protective case. Constant inspection of each part of the flute during the manufacturing process is critical to ensure that the instrument will produce the proper sound. As the instrument moves from one position on the assembly line to the next, workmanship is reviewed. The exact size, shape, and position of the keys and tone holes must be accurate to ensure that they will fit together correctly. The completed instrument is played by an experienced musician to ensure that it produces sound correctly. Because professional musicians often make special demands of flutes, flutemakers will often make small adjustments in flutes to satisfy them. Most flutes are made of metal. Less expensive flutes, intended for students, may be made from alloys of nickel and other metals. More expensive flutes may be plated with silver. All flutes are individually assembled and play tested prior to sale. joints and body should be cleaned to prevent wear caused by dirt and corrosion. The interior of the flute should be swabbed each time it is played to remove moisture, which could cause the pads to swell so that they no longer fit the tone holes. Careful lubrication of the keys with a special lubricant is necessary about every three to six months in order to keep them working smoothly. Very few changes have been made in the basic design of the modern transverse flute since the middle of the nineteenth century. Flutemakers will continue to find ways to make small but critical changes in individual instruments to fit the needs of individual musicians. Two seemingly opposite trends hint at the future of flutemaking. Many performers of music from the Renaissance, Baroque, and Classical periods prefer to use flutes that resemble the instruments used during those times. Such instruments are believed to be more suited to older music than modern flutes, which developed during the Romantic period. On the other hand, many performers of jazz, rock, and experimental music use electronic devices to alter the sounds of flutes in new ways. Despite these two trends, the instrument originally designed by Theobald Bohm is likely to dominate flutemaking for many years to come. Meylan, Raymond. The Flute. Amadeus Press, 1987. Wong, Kate. "Neanderthal Notes." Scientific American (September 1997): 28-29.
have made Northern Region Middle School Festival band and Jazz band every time I'v tryed out and loved it. At my school I am in band, Jazz band, the flute Quintet, and I also play for the chorus when they sing at there concert hopefully you can tell playing my flute is my favorite thing to do in my day. I usually practice 3 hours a day and the only reason I go to school is to have band calss with the best band and chorus teachers in the world. I have high hopes of some day to go to Juilliard. Your article have really taught me a lot about my instriment that I didn't know and has just made my love for the flut and music grow stronger and for that I Sincerely thank you.You truly did a superb job writing this article.